This month we commemorate the 50th Anniversary of the decision in Gideon v. Wainwright, 372 U.S. 335 (1963), which changed the face of criminal prosecution by declaring a broad right to counsel for poor criminal defendants. Go to this page of our blog to learn more about the history of the decision. Here are a few pictures from the December 4, 2012 reception of the Criminal Justice Section of the Philadelphia Bar Association, where Alan Yatvin was presented the 2012 Thurgood Marshall Criminal Justice Award. Read more at the Section’s blog. After Thurgood Marshall Award recipient Alan Yatvin was introduced by David Rudovsky (c), Section Chair Kevin Mincey (l) made the presentation. 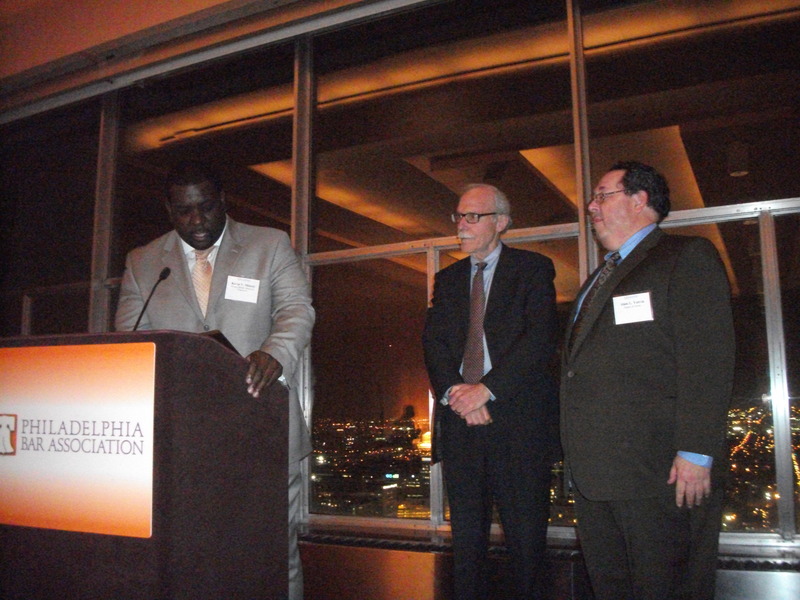 Alan Yatvin received the Thurgood Marshall Award from the Philadelphia Bar Association’s Criminal Justice Section at a reception on December 4, 2012. The Thurgood Marshall Award is the highest honor given by the Criminal Justice Section. It is presented to a person who exemplifies the ideals of Justice Thurgood Marshall’s career. The Award is given for long-time service, not an individual event, although a specific event can be the triggering factor, and is awarded to a person who has devoted time, energy and talent to improving the standards of justice in the Philadelphia and Pennsylvania courts. The Award recognizes significant accomplishments in improving the administration of criminal justice and in achieving the goals of the Criminal Justice Section, and recognizes distinguished service consistently rendered over a considerable period of time.